I have realized that I have really missed writing race reports. 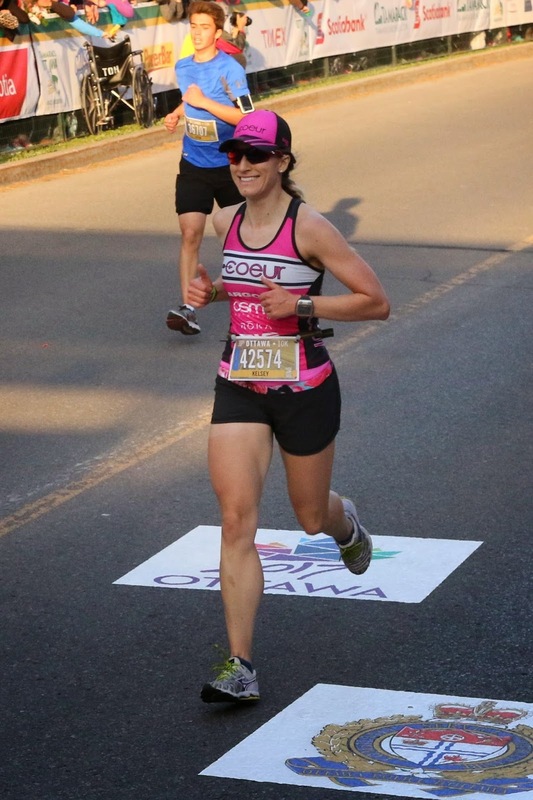 So I am extremely happy to be back to race season, and even happier to have a "good news" race report to share to kick things off! (Yes, I ran a 5k a few weeks ago, but for some reason I'm not counting that as race season.) My apologies for a super long report! That is what happens when I get excited! 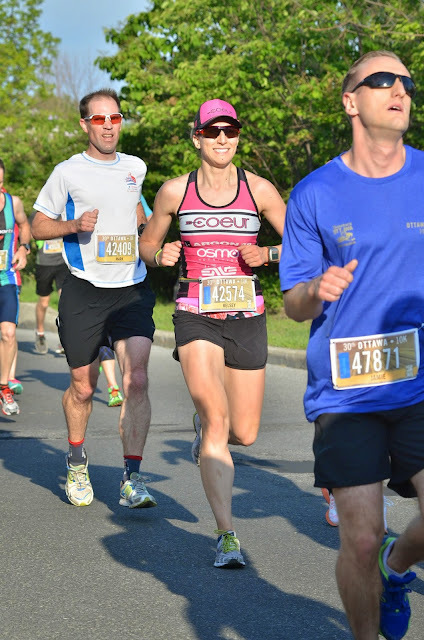 This past weekend was the biggest sporting weekend of the year in Ottawa - the Tamarack Ottawa Race Weekend! 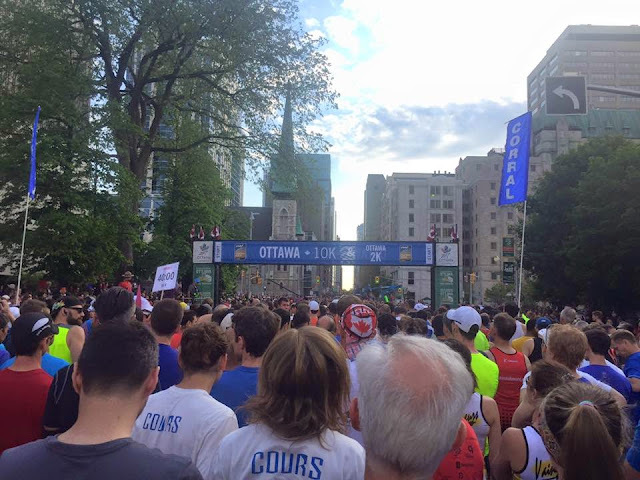 The weekend showcases the beautiful city of Ottawa and attracts runners from all over the world -- 49,439 runners in fact. There is something for everyone, from the 2k family run to the full marathon. And the support from the people of Ottawa is incredible!! 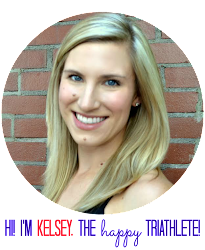 This year the 10k received an IAAF Gold ranking, which is a huge deal, and it was the Canadian National Championships, so it attracted some of the very best runners in Canada and around the world. It was my first time participating in race weekend, and I was excited. For Christmas this past year, I asked my grandma for race registrations, and one of those was for this 10k. Thank you, Grandma!! The race sells out very early every year, so Christmas was about the time that I had to decide to run the race anyways. In the weeks leading up to the race though, I started to hem and haw a bit, thinking that maybe it was a mistake to run such a big, crowded race in my attempt at a new personal best for the distance. I had heard that it was a tough race to PB in, because there were just so many people (over 13,000 in the 10k). But, in the end, I decided that the experience was what I was looking forward to the most and a PB would be a cherry on top! I'm so glad that I decided to run. Race weekend arrived and I was back to being excited to run. After work on Friday, I made my way to the race expo to pick up my race kit and take a tour through the expo. It was overwhelming how many people were there, but the volunteers were fantastic and friendly, and kept things moving quickly. I had a busy evening ahead of me, so I didn't look too closely at the expo, and instead made my way home to do my last shakeout run and prep for our "family dinner" at Gillian's house. I shouldn't be surprised when my shakeout runs feel like garbage the day before a race, but this one felt pretty bad and I was starting to worry about my peroneal tendon, which was quite tender. After a chat with Jenn at dinner and some mobilization of the ankle, I decided that maybe my new shoes were the culprit and decided to wear my old shoes on race day (strangely enough, my new shoes are essentially the same as my old ones, except I did hear that the upper was slightly different on the Wave Sayonara 2 versus the Wave Sayonara, which would potentially be the reason for the issue with my tendon since the 2 feels a bit less stable around my ankle than my old shoes). We had a really lovely family dinner with Gilly's parents who were visiting since her dad was running the marathon on Sunday. We made power bowls full of protein, rice, quinoa, veggies, delicious sauces, and other toppings. We also enjoyed cider from her parent's vineyard - Hoity Toity Cellars - so good! I made a mixed berry, grain-free crisp (drizzle berries with maple syrup, toss with some coconut or almond flour. In a food processor, combine 1-1/2 cups mixed raw nuts - pecans, walnuts, almonds, 1 tablespoon coconut oil, 1/2 cup coconut, 10 pitted Medjool dates, and cinnamon into a coarse mixture. Bake just the berries at 350 until bubbly, then generously top with nut mix and bake an additional 10 minutes (covered in foil).) It was a perfect pre-race weekend evening. On Saturday, I woke up at my usual time to do laundry, relax, paint my nails (Butter London in "Teddy Girl"), and prep to teach barre class. I taught two classes, and tried to keep my activity in class to a minimum. Then I went home, relaxed and ate my normal pre-race meal (oats with almond butter and banana) about 3.5 hours before the race. Throughout the day, I hydrated with Osmo Nutrition Active Hydration. It was a bit difficult trying to figure out what to do with myself for a 6:30 pm race start. In the end, it seemed to work out just fine. At 5:15, I drove downtown, found parking about a kilometer from the race start, and ran over to the starting area. I did my warm-up drills and strides, had one last sip of water, then made my way over to the blue corral for the start around 6:10 pm. I found Mark and Gilly, then just waited for the race to start. The nerves had really kicked in after barre class, and now they were at a full pitch as we listened to the national anthem and watched the elites start. I had positioned myself right between the 40 minute and 45 minute pace bunnies. Finally, our wave was sent off and we ran under the start arch to turn up Elgin Street and get on our way! The best part of the race, by far, was that the streets were jammed with people cheering. Almost every stretch of the course, had at least a few people shouting encouragement and some parts of the course - the starting 2k and the final kilometer - were incredible. It was so motivating to see all of these lovely people out there cheering on complete strangers. It was also motivating when I came across friends and colleagues. Thank you so much!!! You are the best. I gave a few cute little kids high-fives as I passed by during various parts of the race as well. What a mental boost that gave me! It was really difficult, especially with all those cheering fans, to keep things under control in the first 2k of the race. I was trying my best to keep myself on my pace (which I had written on my hand), but the adrenaline definitely took over (out in 6:28 for the first mile, oops!). As I started to "settle in" or maybe "get tired," my pace dropped a bit. I saw Elly (Coach Mike's wife and a friend from Saturday track) at 2.5k and had a quick hello. It was definitely crowded, and I did my best to dodge people and stay out of the way. The first half of the race was quite windy as well. The worst part was that the first aid station wasn't until 4k and my mouth was so dry from having stopped drinking water so long before the race (this did not help me, as you'll see later). I was starting to worry that I had missed the part in the race info where it said there were no aid stations, but then finally one appeared and I slowed down to a walk to have a sip of water. After the aid station, we had a nice little kick up a short, steep hill to get to the halfway point. I shortened my stride and tried to keep pace but keep my heart rate under control on the way up the hill. After the hill, I was happy to see the 5k mark and to see my time as just around 21 minutes. We started into the second half of the race and at first, I was feeling great, but the heat kicked in and the wind died down, and I began to struggle mentally. I tried talking to myself to remind myself that I was really happy to be out there, that I was having fun, that I was lucky to be able to run, and that surely smiling would make me run faster. It seemed to help for a bit, but then I started to worry about my stride - did it seem off? I focused on breathing and just putting one foot in front of the other. At a few points, I tried quickening my stride to get my legs going a bit faster. Suffering a bit along the canal... but not as much as the other guy. At somewhere between 7 and 8k, I saw my friend JP (the 40 minute pace bunny) dry heaving over the canal railing. I asked if he was okay and he waved that he was fine. Luckily for me, he started running again and caught up to me at about 8.5k. I ran most of the rest of the way trying to keep up with him, and feeding off the energy of the massive crowds cheering along Queen Elizabeth Drive. It felt great to look down at my watch and see that my goal was within sight (and to look down the road to see that it was physically in sight too!). But... then I peed my pants. Yep. Again. Dang it. I had taken every precaution, or so I thought. So, as much as I wanted to sprint the finish (especially since I could see how close to sub-42 I was), I had to just run and try to keep moving, while simultaneously hoping that pee wasn't flying off of me and hitting the runners behind and hoping those lovely people cheering didn't notice either. So 42 ticked by, but I was close! And I remembered to smile as I crossed the finish line! So happy to have a good race and so happy to be done! Big smile and thumbs up on the way across the finish line! Final time was 42:18.8, a new PB by almost 2 and a half minutes, and good for 10th in my age group. I was really happy with my race and so thankful for all the volunteers and people cheering for all of us. 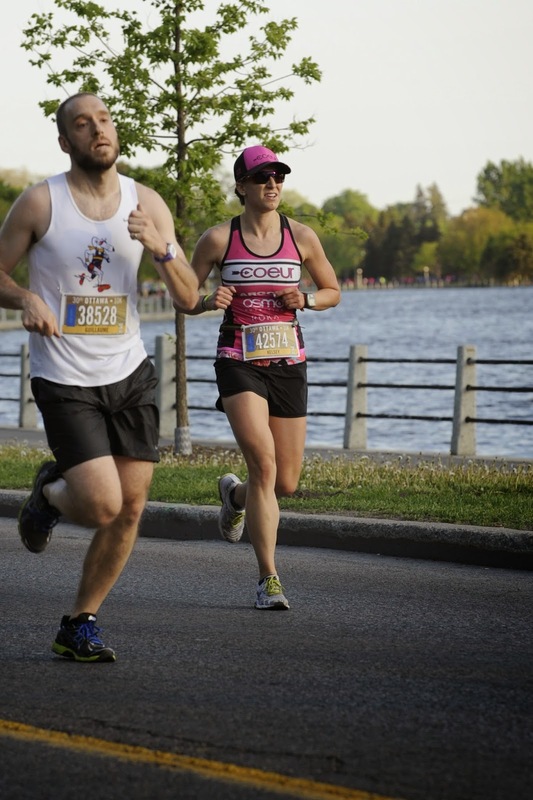 Ottawa Race Weekend is truly a stellar event and I will definitely be participating again. 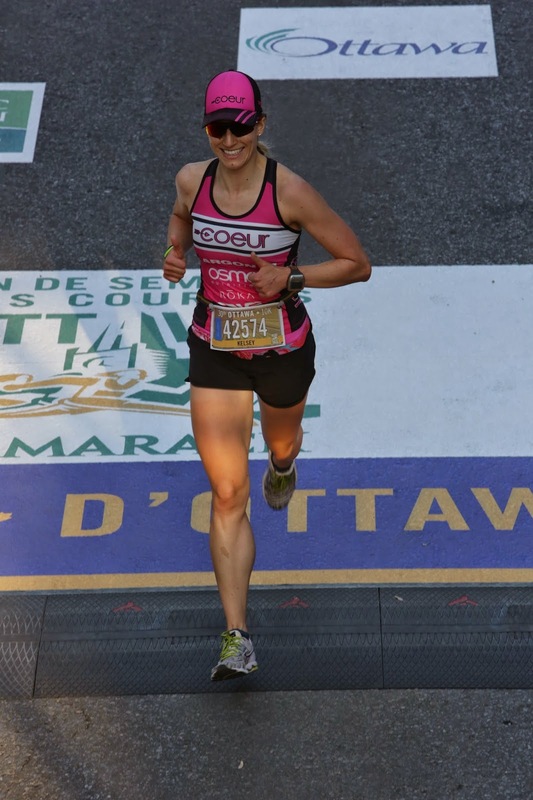 I also loved sporting my Team Coeur Sports race top! With Gilly post-race. She also set a new PB!! Nice job on your race! That's an awesome idea Kristin!! It is such a fun event!! Thanks Kristen! 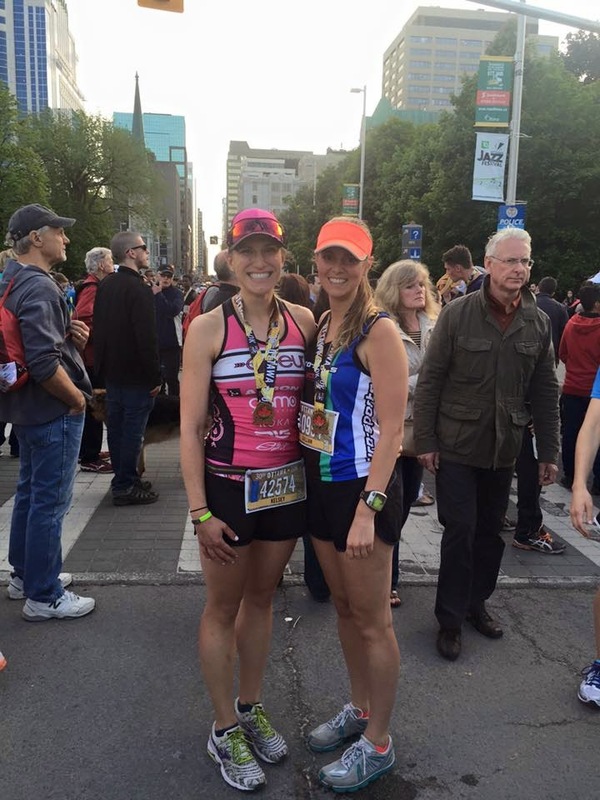 I was so happy with the race and now, more excited than ever for my first triathlon of the season (3 weeks away!). Awesome report!!! Congrats on the PB!! Looks like such a fun race! Loved hearing all of the details!! Thanks Leslie!! It was so much fun! Nice shots of your quads! I love Ottawa...I ran the Fall Colors half marathon there years ago. I also have family there so it's dear to my heart! I love Ottawa too :) And I'm actually thinking of running the Fall Colours half this year!